He is among the most successful and currently the No. 1 golfer in the world. His level of achievement is legendary. He is focused, highly skilled and can probably perform at this level for many years to come. Like many super-performers he knows there are times to step back improve, re-tool your skills and evaluate your game. You just have to take the a break sometimes. When he does nobody says, "He's done! Golf is finished!" They wait and watch him comeback new and improved. That is what is happening in Alberta Real Estate. The global economy is wonky, oil prices dropped and the housing market was way over-heated. So the market cooled down, prices dropped and then regulated and the market became more balanced. Edmonton, Alberta real estate is still a "Tiger Woods" area - super performer says Don R. Campbell of REIN. "People need to be realistic,.....The last three years in Alberta have been the Tiger Woods years of real estate. No matter what you did, you won, but that can't sustain forever." "Alberta still has the three things the world is going to need when the recovery hits. It has food, fuel and fertilizer and those are the things the world needs and needs in abundance,"
I'm going to save you the trouble of wading through a long page of B.S. to dig out the nuggets of truth that can help you. My goal is to partner you with equity building Edmonton, Alberta Oil Sand Real Estate, putting strong appreciation and cash flow into your investment portfolio. Depending on where you live and what you've invested in up to now you may have varied views on stocks, currency trading, precious metals and real estate. Some are essential parts of a balanced portfolio, others, a fast way to losses if you don't know what you're doing. In the current economic environment, owning hard assets that will be in demand and provide income regardless of which way the economy goes makes a lot of sense. These investment properties take the major risk factors out of the equation, while providing you upside potential returns normally associated with higher risk investments. You can sleep at night while your money works for you. If you lack the time or expertise needed to operate a revenue property successfully, don’t worry – that’s what I do. All of our investments are joint venture partnerships. I’m committed to make you a decent return. Frankly put I earn my profit from the success of our partnership, so if you don’t make money, I don’t make money. I’m I nice guy, but I don’t work for free. What can you buy in major centers across Canada for $500K. A lot of house! Except Saskatoon talk about a delusional market. I read this article today and thought well everyone knows that Vancouver's real estate market, especially the condo market is overpriced. So am I surprised? However, the headline is so misleading. How can anyone compare cross Canada Real Estate values in one sweep? It's an effective scare tactic. If it's your home the value is in you living there and having a roof over your head. A home is not an asset unless it produces cash flow. Ask Rich Dad. "The next 20 years will not look like the past 20 years in terms of growth," "Don't get trapped into where we are now, but look forward to the key drivers of trade," "There will be recovery and the response from trade will come quickly." Chris Holling, executive managing director, global trade and transportation advisory services, IHS Global Insight. No, it's not what you think. Although mortgages are getting so tough to get if you are an investor it might be something you have to prove pretty soon! Virgin Group (music, airlines, stem cell banking, hot air balloon rides and mobile phone services) is entering the mortgage business at a time when most people are leaving it. Seems like the perfect crisis= opportunity situation that we often hear about. Apparently Virgin Money USA's loans will be cutting edge, competitive and just what the doctor ordered for those seeking financing in the US market. These aren't available in Canada yet but I certainly hope they will be soon and that there is an excellent investor package. Typically February is a 'cold and flu' month. In Japan many people will don white surgical masks as a step toward protecting themselves from viruses. This proactive form of cold prevention is called 'yobo'. It's true when you're sick you may also wear a mask as a consideration to others, to help reduce the spread of your virus. Perhaps we should all equip ourselves with a mental mask, one that lets in the facts and filters out the negative opinions that graft insidious influence into our thinking. Turbo charge your portfolio. Stylish 3 bedroom 1.5 bath town home has over 1205 sq ft of rental space plus 2 parking stalls. This unique complex was built in 1979 and has many upgrades as well as a strong reserve fund. Your unit has new carpet and laminate added this year. Comes complete with great tenants making this a totally turn-key property for you. Convenient area with nearby access to the new Ring Road and refinery row. Excellent neighborhood and HUGE upside potential due to the great purchase price, strong economic fundamentals and the growing expansion of Edmonton's North West neighborhoods. Produces $124 positive cash flow per month using an investor's mortgage plan - taking advantage of current low rates. Poised for massive growth. This home rents for top dollar and has everything arranged, including financing structure and incredible tenants. Your investment includes: financial analysis, professional inspection, insurance, financing set-up, legal fees, basic accounting, reserve fund, CMA, bi-annual statements, strategic market planning to ensure successful entry and exit, plus much more! Your Estimated 5 Year Profit $36K. Already producing a great RETURN. Visit HERE for the full FEATURE sheet and call 1-888-780-5940 to get started. Edmonton Economic and Development Corporation is an excellent resource for anyone interested in moving to, investing or starting a business in Edmonton. Their site is full of free research, documents and links for the public. Encourage a positive regional business and investment environment. Ron Gilbertson President and CEO of the EEDC has spoken at REIN and has an excellent PDF available for download. Outlining Edmonton's challenges, threats and goals - it is a quick and informative must read. As a service hub to Fort McMurray and the rest of Alberta, and with strong education and health-care sectors, Edmonton can weather the economic storm, he says. The market we are seeing in Edmonton today is not so bad. In fact it's normal. There are a lot of properties to choose from and market prices aren't all over the place. If you are a landlord the one thing you will have to contend with is renting your property and keeping it rented. Edmonton's vacancy rates went from 1% to about 4% now. That isn't really bad as long as you aren't in the 4%. Make sure your units are well maintained with a good property manager. Rents are dropping so if your investment property was negatively cash flowing before you had better be very careful. It could turn into an alligator (Rich Dad - an investment that eats you). Do whatever you can to reduce your costs: lower amortizations, if your bank allows it skip one payment, reduce maintenance and keep expenses to a minimum. Cash flow is king in this market and actually in any market. Today I received my REIN CDs in the post. After loading them into itunes and started to listen to Don Campbell and all the great information for this month. Usually Don recommends a book and often times I buy it. In the past he has recommend some really great books that I have listened (I love Audible.com) to two or three times -Freakonomics, Made to Stick and Three Cups of Tea. Today he recommended a book that I am already reading; The Omnivore's Dilemma by Michael Pollan. It IS fantastic. I have been a fan of Pollan's since I read The Botany of Desire two years ago. It was at the time and may still be one of the most interesting books I have ever read. Once you read The Omnivore's Dilemma you will never feel right about eating corn fed animals again. I have noticed the the term corn fed has become a marketing slogan , as if it is better for us or higher quality. It may be a lot of things but it is certainly neither of those. But that is for you to decide. 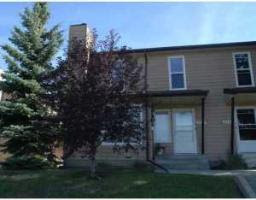 North West Edmonton: Cashflowing Dunluce Town House In High Growth Area Turbo charge your portfolio. Stylish 3 bedroom 1.5 bath town home has over 1205 sq ft of rental space plus 2 parking stalls. This unique complex was built in 1979 and has many upgrades as well as a strong reserve fund. Your unit has new carpet and laminate added this year. Purchase price: $214K Total Investment: $60.8K. Your Estimated 5 Year Profit $36K. I used to love listening to CBC Radio but after Morningside's Peter Gzowski, Vicki Gabereau and of course Finkleman's 45's left, my heart did too. Presenter: That's very interesting, tell me more. Just a little joke to put a smile on your face. Remember Pareto's law? 80% of people are frozen (in this case) fear, while 20% are out there investing (in action). The Pareto principle states that, for many events, roughly 80% of the effects come from 20% of the causes. It was named after Italian economist Vilfredo Pareto, who observed that 80% of the land in Italy was owned by 20% of the population. The original observation was in connection with income and wealth. Pareto carried out surveys on a variety of other countries and found to his surprise that a similar distribution applied. Because of the scale-invariant nature of the power law relationship, the relationship applies also to subsets of the income range. Even if we take the ten wealthiest individuals in the world, we see that the top three (Warren Buffett, Carlos Slim Helu, and Bill Gates) own as much as the next seven put together. The Pareto Principle also applies to a variety of more mundane matters: one might guess approximately that we wear our 20% most favoured clothes about 80% of the time, perhaps we spend 80% of the time with 20% of our acquaintances, etc. As you follow the news, remember to step back and see how the 80/20 rule plays out. There are plenty of good deals out there that 80% of the people are missing.